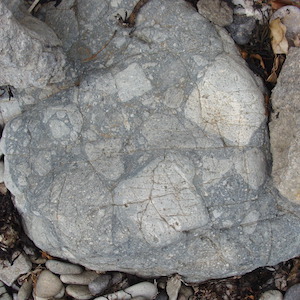 Agglomerate. (L. ad = to, glomerare = to wind into a ball). Agglomerates within ignimbrite and rhyolite sequence, Anne Port Bay to La Crête Point. Agglomerates are coarse grained igneous rocks with rounded to subangular fragments mainly larger than 2cm in size, unsorted and set in a fine matrix (Allaby & Allaby, 1999, p. 9-10). The angularity is generally a result of a vent explosion during which the solidified plug is blasted out and the angular clasts are deposited in irregular layers on the flanks, or a result of the breaking up of flow surfaces during autobrecciation, or of breaking up in mudflows (lahars). 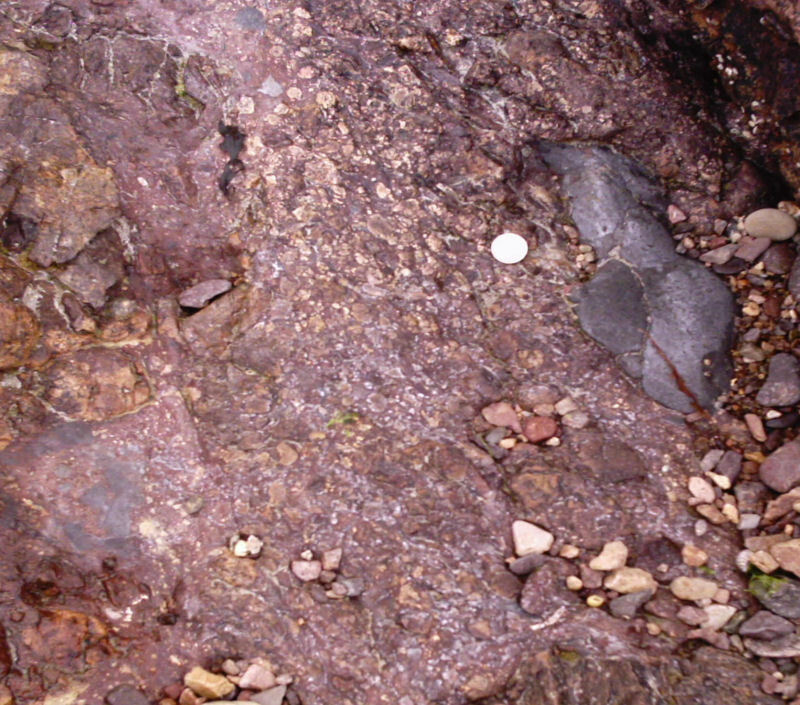 In Jersey on the south coast, there are excellent examples in the St. Saviour's Andesite Formation - the Bathing Pool Agglomerate, west of St. Helier, which consists of andesite fragments with shale and porphyry fragments and is thought to represent the results of a vent explosion. On the north coast between Le Côtil and Frémont Points, various intervals in the St. John's Rhyolite Formation have agglomeratic units, eg. in the Bonne Nuit Ignimbrite and Bonne Nuit Tuff (Bishop & Bisson, 1989, p. 25-26). 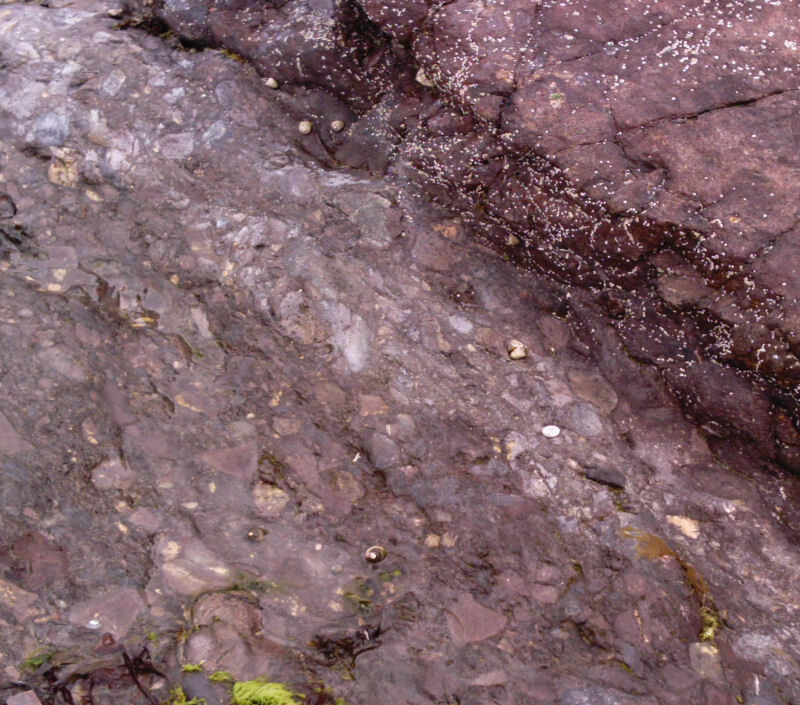 In the overlying Bouley Rhyolite Formation, agglomerates occur at the base, seen in Giffard Bay (below left), and within the sequence forming the Giffard Andesitic Agglomerate (loc. cit. p. 30-31). 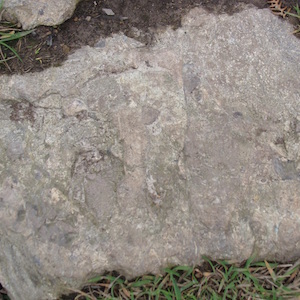 On the east coast on the north side of Anne Port Bay, agglomeratic looking deposits occur at the base of each flow, described as rubbly base deposits (loc. cit.pp.34-35). The tops of the flows are autobrecciated and the larger flow-banded blocks can be confused with those of vent explosion deposits.